Pre-owned 2010 Prestige 1100 with less than 4,000 hours. 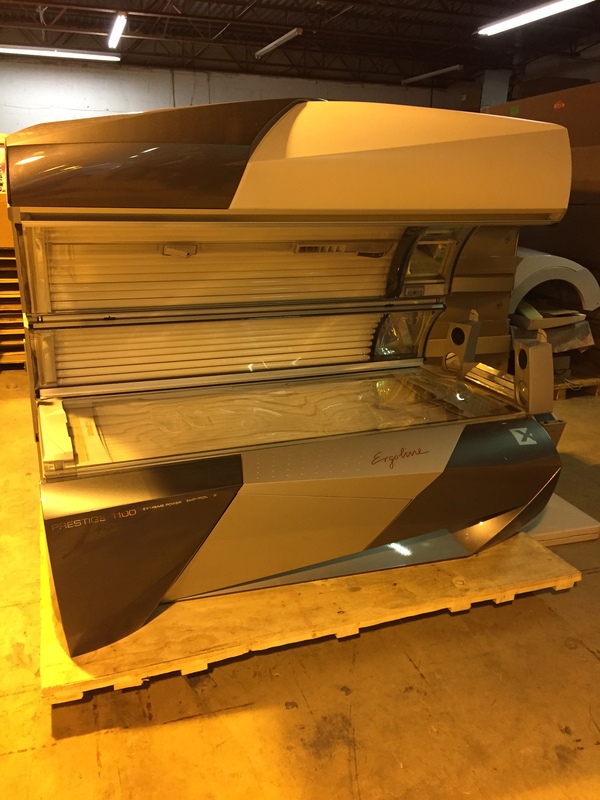 The Prestige 1100 introduced the tanning industry to luxury tanning over 5 years ago and It STILL maintains a high standard at Salons across the world. The enclosed tanning cabin ensures the customer will enjoy their 10 minute tanning session in the climate of their choice! 52 Dynamic Power, 200-watt UV lamps for a deep body tan, the advanced facial tanner system with 4 Ultra Performance high-pressure units and 3 additional UV-B spaghetti lamps leave nothing to be desired, while 2 high-pressure shoulder tanners with Ultra Performance technology seal the Extreme Power package. We have thought of everything when it comes to comfort and convenience, too. Thanks to acrylic panels at the head and foot ends of the sunbed, individual temperature levels are achieved quickly and maintained throughout the session with Temptronic Plus. These panels also help shield against external noise and allow your customers to fully enjoy the impressive 3D-Sound system with its MP3 dock-in and SD card slot. Aqua Mist & Aroma provide a refreshing sense of relaxation to the experience, while the innovative cockpit control – with its clear symbols, user-friendly Voice Guide and full-text display – grant total ease of use.